Camino de Santiago begins with a tour of León and Ponferrada O Cebreiro. 9:00 Pick up at Leon, in the hotel. 11:00 Departure from Astorga to Ponferrada by the Camino de Santiago. - Stop at the Cruz de Ferro (11:30 h.) to deposit the stone and take photos. 14:30 we head to the resort of Las Medulas ( Ancient Roman Gold Mines ), where we will walk along the paths and caves for about 1 hour. Finally we move to O Cebreiro (arrival time 18:30). 12:00 Pick up at Leon, in the hotel. 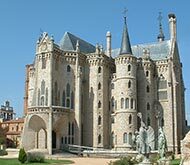 14:00 Departure from Astorga to Ponferrada by the Camino de Santiago. - Stop at the Cruz de Ferro (14:30) to deposit the stone and take photos. 18:00 we head to the resort of Las Medulas ( Ancient Roman Gold Mines ), where we will walk along the paths and caves for about 1 hour. Finally we move to O Cebreiro (arrival time 20:30). - Palacio Episcopal de Gaudi (hora de apertura 10:00). - Stop at the Cruz de Ferro (11:30 ) to deposit the stone and take photos. Check in at Ponferrada approximately 12:00 h.
Check in at Ponferrada approximately 15:00 h.